The moving coil loudspeaker is by far the dominant electroacoustic transducer. SEAS design and produce from high end quality parts, using complicated procedures and incorporating a highly skilled workforce to satisfy even the most critical listeners. At SEAS, we take pride in working according to the highest standard. We put a lot of effort into designing speakers, using materials and techniques which give the best audible results. Many critical parts are produced in-house; some by special purpose machinery designed and built by SEAS. A by-product of this approach is that we are quite flexible in complying with the changing demands of our customers. Quality is the key word in every aspect of our activity. We closely monitor the quality of the parts and materials which we purchase, as well as the parts and operations made in-house. We use sophisticated equipment and highly trained and experienced personnel to check that our finished products meet their specifications. We also try to act towards our customers and suppliers in a way which contributes to the total quality of SEAS. All SEAS products are manufactured in compliance with the regulations in EU’s RoHS directive. On our website you will find a large number of products which are all readily available. In additional, we produce an increasing amount of products, developed in conjunction with our customers, which are exclusively available to them. If you have special needs, do not hesitate to ask. 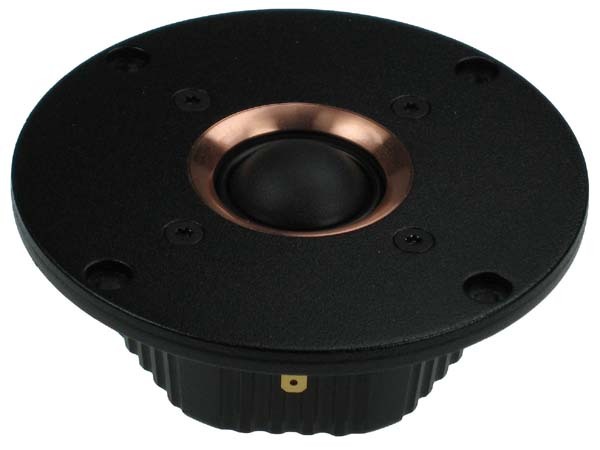 We have dome tweeters with 19 and 25 mm voice coil diameters and different surround diameters. The rigid chassis are made from glass filled engineering plastic materials by injection moulding. The cosmetic standard of our chassis is very high and may be custom designed to specified shapes, surface finishes, fixing holes, logos etc. The possibilities are endless. The corresponding tool expense is quite reasonable. We offer dome diaphragms made from materials such as aluminium, soft impregnated fabric, and titanium. Both the aluminium and titanium is equipped with a soft surround which suspends the dome diaphragm in a compliant, but precise and dependable manner. All dome diaphragms and surrounds are made in-house at SEAS, except for anodized aluminium, beryllium, diamond and titanium. The relatively fragile aluminium diaphragms may be protected by wire mesh, perforated metal grilles, or plastic diffusers. The diffusers also linearize the frequency response to an amazing degree. 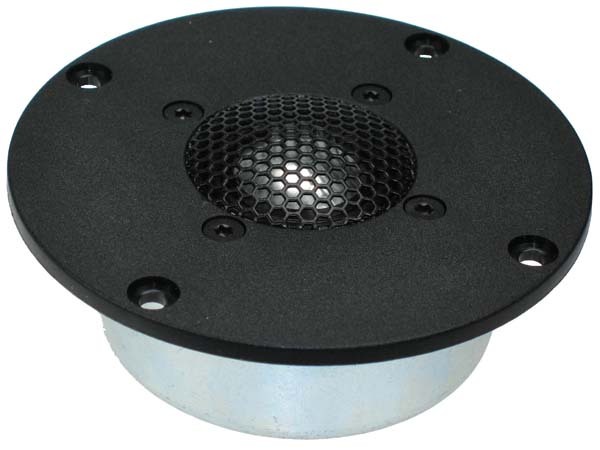 The 25 mm voice coil dome tweeters with ferrite magnets may be equipped with a damped hole in the magnet pole and with a rear chamber, thereby offering a low resonance frequency. The voice coil may be fitted with braided lead out wires for applications which involve larger coil excursions. The highly efficient magnet material made from Neodymium, lron and Boron has been used both in small 1" dome tweeters for general use and in specialized tweeters for our coaxial drivers. All SEAS tweeters are available with magnetic fluid in two different viscosities which improves the heat transfer from the voice coil. It also introduces mechanical damping of the voice coil. The resulting smoothing of the impedance curve simplifies crossover design considerably. Our cone drivers are generally based on injection moulded zinc chassis, which are powder coated for attractive and durable protection. The moulding process allows us to locate the material exactly where it is needed for stiffness and strength, which is essential to high quality sound reproduction. Aluminium (which is very stiff, yet reasonably light). Paper (a wide range of different pulps are available along with a highly efficient coating material for dynamic control). We also have Polypropylene (unfilled, or mineral filled for increased stiffness). XP (an optically transparent high polymer material which is light, stiff and well damped). Glass fibre weave (which is impregnated for stability and dynamic control). Surround materials range from several different low loss natural rubber qualities for specialized woofers, to different high loss rubber intended for high accuracy in midrange reproduction. Our impregnated fabric suspensions are generally flat and with slightly progressive stiffness characteristic for excellent linearity and stability. Our voice coils are generally made from copper wire with duroplastic coating, allowing coil temperatures of 220-250 degrees centigrade before disintegration. We also have voice coils made with copper clad aluminium wires (CCAW) available. 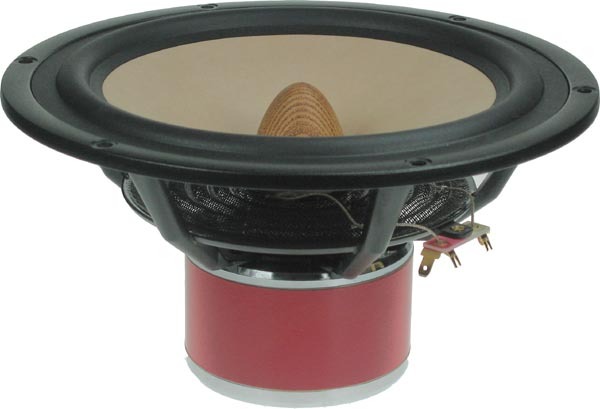 Although most drivers are equipped with two layer coils, some woofers have four layer coils for higher inductance and reduced high frequency output. Most coils are wound on aluminium formers for high strength and heat dissipation. We also supply non-conducting formers without compromising on thermal or mechanical strength. These are made from Kapton, Nomex or Glassfiber. The magnet systems are based on high quality barium ferrite magnets, and soft steel parts which are precision turned or fine blanked to ensure the highest dimensional tolerances in the critical gap area. The parts are bonded together by a heavy duty two component adhesive. In order to reduce the magnetic stray fields for audio/video applications, we offer compensated magnet systems. A shielding cup enclosing the compensated magnet system, may be added for the most critical applications. We also offer shielding kits to our standard drivers presented in this catalogue. The dust cap has great influence on the behaviour of a drive unit at high frequencies. We offer dust caps made from various paper qualities and from fabric. All of these may be coated for dynamic control. 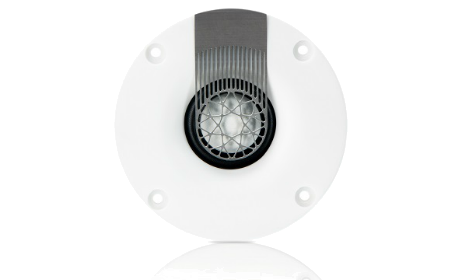 Dust caps made from Polypropylene, Aluminium and various PVC qualities are also available. Instead of the dust caps, we also offer phase plugs which eliminate the cavity inside the coil former, thereby lowering sound colouration. Since the phase plug improves the air circulation around the coil windings, the coil temperature variation as well as the consequent sensitivity modulation are lowered. Further, the power handling capacity is increased. The lead out wires are made from high quality materials for durability and dynamic control. We also take great care in arranging the wires so that they move in a smooth, controlled way. In order to assemble the above parts correctly, consistently, and in a durable way, we use high quality specialized adhesives and application equipment. Precision jigs and fixtures keep the parts firmly in position while the adhesives set. This is important, because in many positions, especially between cone and surround, the type, amount and distribution of the adhesive have great influence on the performance of the driver. We hope that the above gives an impression of how much we care about the quality of our products for the benefit of you as our customer. The Excel cone drivers are based on injection moulded zinc baskets ranging in diameter from 12 to 26 cm. Cones made from magnesium and NEXTEL coated paper are available. The magnet systems are equipped with heavy copper rings and a copper phase plug which reduce flux modulation and eddy current distortion. Furthermore, the copper parts improve the heat transfer from the voice coil and pole piece to the outside air, thereby reducing the coil temperature and subsequent voltage sensitivity modulation. The Excel tweeters are based on injection moulded zinc or machined aluminium front plates and a sub chassis, for excellent rigidity and stability. The Millennium was the first driver to take advantage of our patented Hexadym magnet technology. Now our new tweeters, Crescendo and Magnum, bring this technology to an even higher level. The magnet system is based on 6 radially magnetised NdFeB blocks and generous vents which eliminate cavity resonances and high speed air noise. Even the rear chamber is made from zinc for excellent structural stability and heat transfer. We offer different diaphragms (fabric, aluminium and magnesium) perfectly matched to our SONOMAX surround. All Excel drivers are equipped with gold plated terminals for low contact resistance and excellent reliability. The EXCEL range is developed to satisfy the most demanding and critical audiophiles. During the technical development that resulted in high power amplifiers in combination with small, long throw woofers, there have been quite a few music lovers who have remained faithful to vinyl records, tube amplifiers and other equipment declared more or less obsolete in the mass market. In order to be able to offer a loudspeaker driver to such dissidents, Seas has developed a few outstanding products based on traditional knowledge, but at the same time using the best materials and technology available. The first product in this line is a 22cm fullrange driver. Our aim has been to develop a high efficiency point source with adequate bandwidth, good tonal balance and low distortion. Together with high quality sound equipment, it should result in an effortless, natural sound reproduction even when low power amplifiers are used.